Back from the Battle Mesh | Ivan. Loves. Gazpacho. 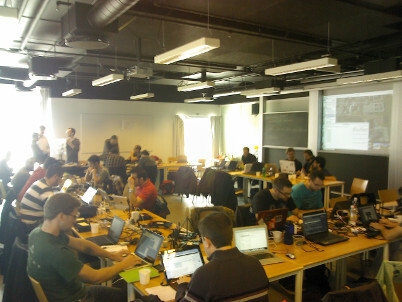 The days were a combination of hacking, talks and socializing. On the hacking part I was impressed by Pau and Jo-Philipp's work on the scripts to prepare, lauch and collect the results of the multi-protocol routing experiment running on the bunch of routers scattered all around the (big, Quake labyrinth-like and mostly uninhabited) building. I also liked the talk by Nico and Gui from AlterMundi on MiniMaxi which covered very disparate aspects on hacking a community network together in a left-behind area, with some solutions that were surprisingly similar to those adopted at the CONFINE project for running the management network (e.g. tinc plus a JSON-based REST API). From our part there was my (somehow rushed) talk on Community-Lab, Leandro's talk on CONFINE, Javi's lightning talk on Avahi/Zeroconf and Alejandro and Fernando's one on Bottom-up Broadband. I brought two Community-Lab research devices were I managed to run a couple of slivers after much struggling, which unfortunately left me with too few time to properly prepare my talk. Nonetheless I spotted some uncomfortable but easy to solve issues that should, when fixed, make the testbed much more usable, so I reported them all at once (I hope my colleagues don't feel like hitting me when I'm back at the office :P ). I also had the time to talk with Jo-Philipp about this wild idea of running a full minimal OpenWrt system with its own kernel in research devices and using kexec to chainload the actual production kernel and image. 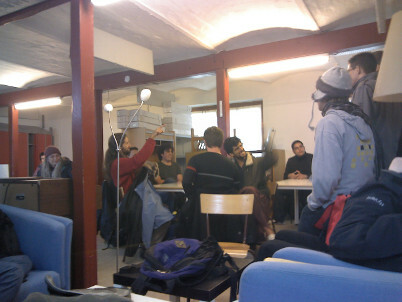 The dicussion was very productive and will help define a complete proposal. 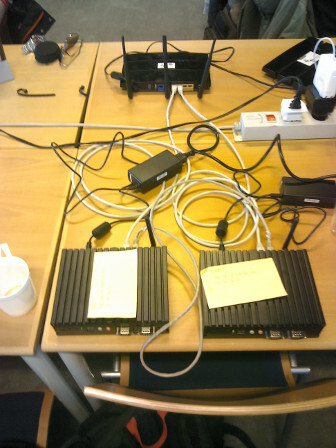 Two research devices behind a single community device, yeah! Last but not least, I met lots of new people and put faces to some others that I only knew via email. All of them very nice people, this is always my favorite part of these meetings. I particulary liked the exclusive visit to NOVI's bar (full with table football, pool table, sofa and console) were we found a secret area ;) where we could play Guitar Hero on a projector with surround sound, and the visit to the briliantly named HAL9K hackerspace where lots of discussions took place. All in all, the organization was brilliant. Enviat per versvs el Dll, 2013-04-22 16:51. Even though I didn't comment yet, I'm enjoying a lot the new series of posts on the CONFINE project. Enviat per Ivan el Dm, 2013-04-23 10:29. I hope that everything's going well. One big hug! Enviat per Testing the testbed | Ivan. Loves. Gazpacho. (no verificat) el Dv, 2013-05-10 12:00.